Last Monday ended up serving as a good reminder to me to stick with The One Thing a Day plan. 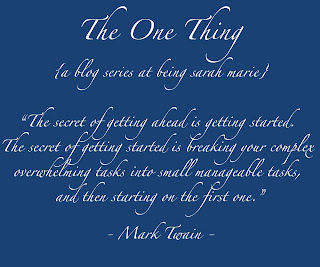 I woke up with a few errands on my to-do list, and as the morning wore on, I kept mentally adding more and more. Nathan had reminded me that I needed to go to the bank to deposit checks from my students as well as rent checks from our tenants. Then, there I was, thinking, "While I'm at the bank, I should go to Target, which is nearby, because we need various things, and then I should stop in at Nordstrom Rack because poor Nathan needs new dress shirts so badly, and... and..."
As other moms can probably imagine, what would have been a 20-minute errand at the most was quickly becoming the kind of outing around which naps and diaper changes and feedings had to be carefully planned, and all leaving time for me to get home and prepare for my afternoon teaching and for leaving Nell with a sitter, etc. Which really meant, it probably wouldn't get done. So, I reminded myself of The One Thing. And I scooped up my baby, and went to the bank. I didn't piggy-back three or four other errands on to the trip, because I knew I wouldn't get it all done if I did, and I probably wouldn't even get it started. But we did go to the bank, and deposit those checks! And The One Thing triumphed again. On Tuesday, I cleaned the microwave out. And let's just see it was embarrassing how badly that was needed, and leave it at that. And by the end of the week, I had also disassembled and cleaned and laundered the fabric parts of all of Nell's toys and seats - her bouncer, her walker, her car seat, her stroller, and the jumper on loan from a friend. I had gotten a real steal on some used diapers. And of course, I had done the grocery shopping, kept us fed around here, taught my students, tried to keep a modicum of order around the house, and cared for my baby. And that's enough, I tell myself. 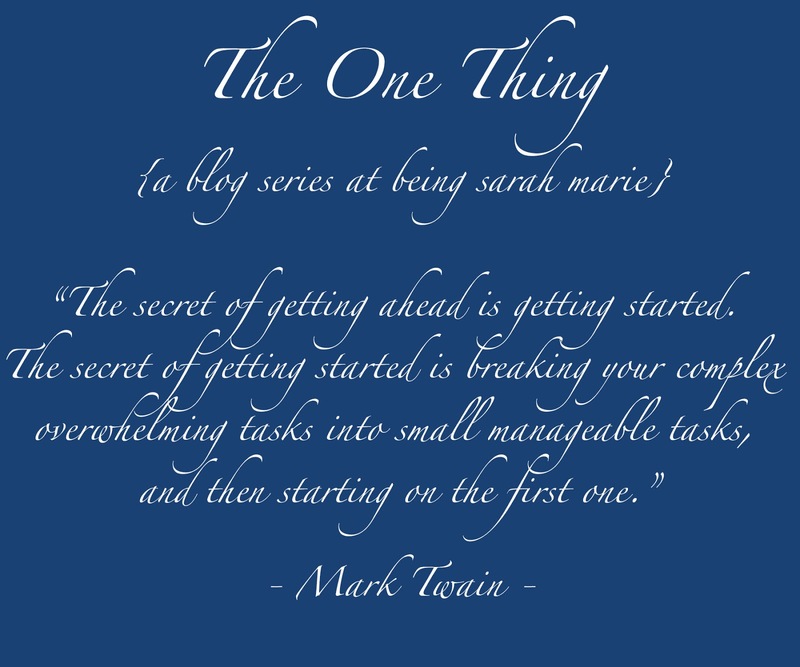 Inspired by Mark Twain, the One Thing series is all about making life manageable by taking on one thing a day, one project or task or errand outside of the daily essentials that adds beauty or order to life. This is my way of avoiding my pitfalls of making extensive to-do lists, starting lots of projects, getting overwhelmed, and not finishing anything.